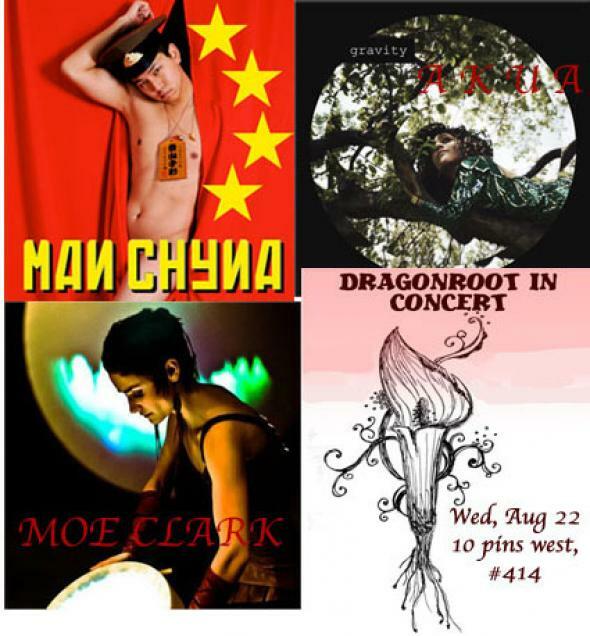 CKUT is teaming up with the 2110 Centre for Gender Advocacy to bring Montreal a t-r-u-l-y special Dragonroot concert featuring MANCHYNA, Moe Clark and A K U A! A K U A combines a variety of raw and deeply personal songs and soundscapes supported by a seriously distinct and versatile vocal talent. Her style is remote soul mixing elements of soul, folk, pop, electronic and R&B. Listen here. MAN CHYNA burst from a Smoky Mountain-womb just like his personal (s)hero, Dolly Parton. Part burlesque and part faggotronic rap, Man Chyna strip hops around Canada like a sissy M.I.A (Sissy Elliot?). Won’t you be the Boy-oncé to his Gay-Z? Mo Homo! REPRODUCTIVE JUSTICE CHOIR invite you to join them in medleys of access, choice and self-determination! In case you haven’t heard, the Dragonroot Radio project is a joint collaboration between CKUT and the 2110 dedicated to bringing feminism, gender issues, the latest news, incredible musical talent and discussions on cultural happenings to the airwaves. This entry was posted in Events and tagged Concert Listings on August 20, 2012 by admin.